Create a exam at OnlineExamMaker is very easy, it only need 3 steps, takes only few minutes. The steps will be introduced below. Title field, is the title of the exam, or the name of your exam, you should fill in this field with meaningful words, like ACT math exam for grade tree. Set exam private field, if you checked this field ( this is enabled only for the paid VIP user ) if you do not want your new exam be shown at the public. First you should at least join the basic subscription. Keywords, the keywords of your exam, this is used to SEO your exams, your can tag your exam by set the keywords, this is very important. 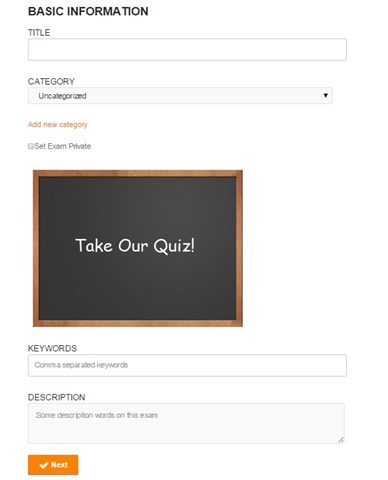 Description, the descriptions of your exam, write some words in this field to describe your exam, your students or employees may read and understand your exam more deeply. After you filled all the blanks above, just click the Next button at the end of page, and you will get into the step 2 of OnlineExamMaker exam creation work follow. In this step, you need to select some questions from the bank or create some questions for your exam. 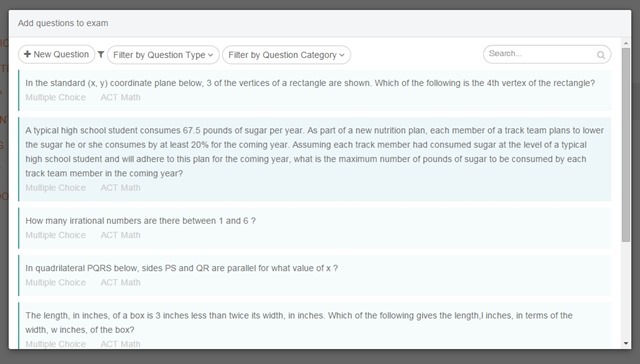 In the top of the window, you can filter questions by question type, question category; also search your questions. If you have not got any question for this new exam, you can click the New Question button at the top left of the window. After the filter section of the window, listed the questions you have been added before in your question bank. 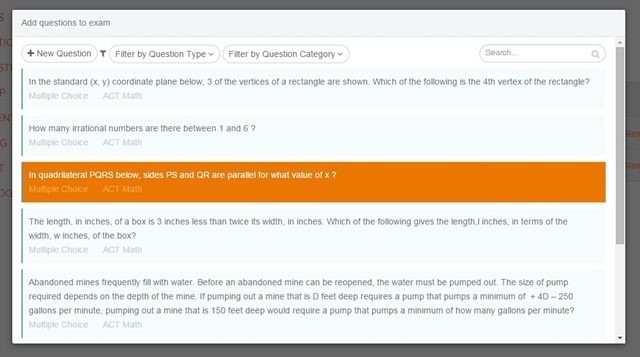 Click it to add to this new exam, if the question successfully added to the exam, the color of this question will be orange, just like the following image. If you have added the questions, then click the Next button at the bottom of this page, go to the step 3. Step 3. Make some settings. If you do not want to do some settings, you can navigate to other pages by click the left menu at this page. 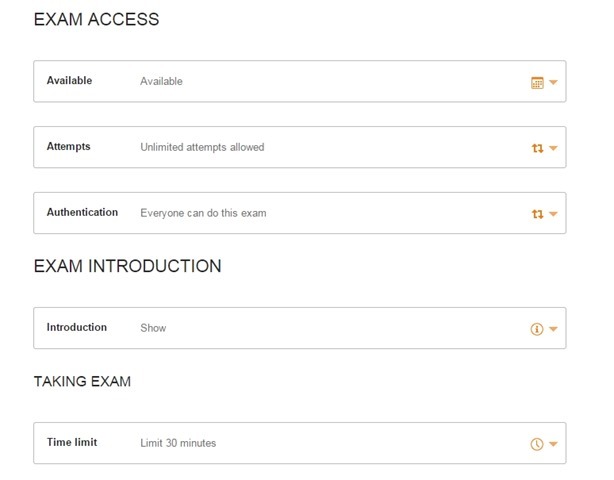 In the settings page, you can set the exam available date time, authenticate type, attempt times, time limits, question per page, pass mark, theme of the exam and etc. If you don’t know how to setting this options, just click the save button at the bottom of this page. Click the finish button at the end of the page, then the new exam will be setup successfully. At this time, a new full customized, questions added exam have been added. Now you can share with your friends. 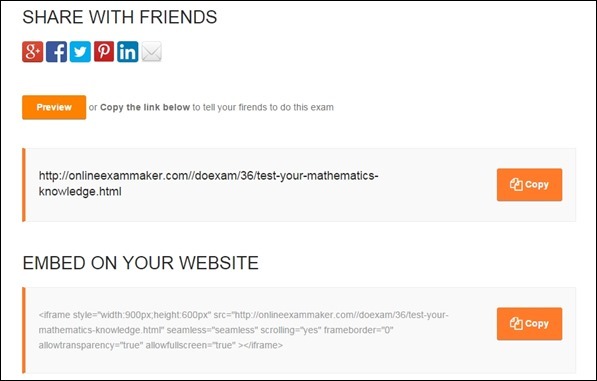 You can easily share the exam with your friends by Facebook, Google +, Twitter, Pinterest, LinkedIn or email, just need to click the buttons showed in the above image. You can also copy the exam link and send to your students or employees directly by IM. If you got a blog or website, you can copy the embed code at the bottom of the page and past on your website to let your visitors do the exam. Create a new exam and share with friends is very easy on OnlineExamMaker. You can now create a new exam right now in minutes.